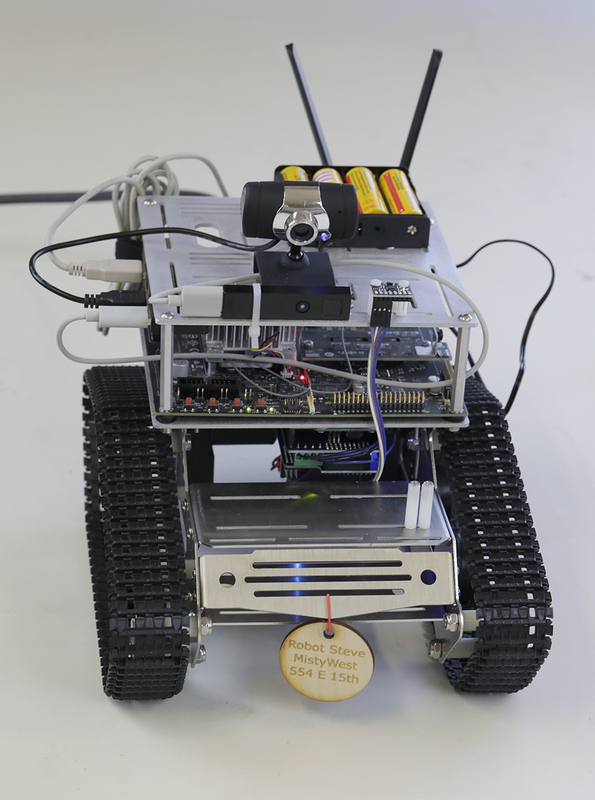 RoboSteve is a mobile robotics platform used to study machine vision, machine learning, robotics and ROS. The end goal is to foster learning, with the intention of being able to show off the office robo dog! All elements of the project will soon be open sourced and freely available on Bitbucket! Creating a realistic robotic dog body was beyond the scope of this project. Instead, we decided to use an off-the-shelf robotic car platform with simple motor controls (and who knows? Maybe we’ll eventually add a robot arm!). After a long journey of trying different RC car chassises, we found that they were not able to carry the weight of our compute and sensor suite platform. In the end, we purchased the Kuman SM5-1 track robot platform; a basic track chassis, but large and sturdy enough to for our needs. 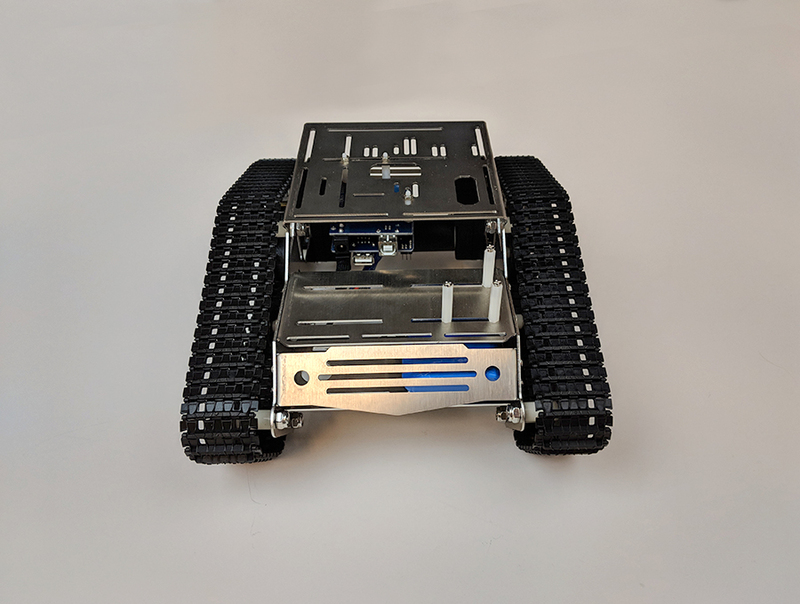 It also comes with an Arduino compatible control board, a motor driver shield, a USB camera on a servo swivel mount, and an externally powered servo shield. We mounted the Arduino and the additional driver boards underneath the chassis. We changed the Arduino-compatible board to a genuine Arduino Uno. We found that the serial port of the clone did not connect to the TX2; this could theoretically be solved by compiling the correct kernel module on the TX2, but as we had a genuine Arduino lying around in the lab, it was quicker to just change the boards. After setting up the Kuman SM5-1, we found that we still didn’t have enough space for all our components. 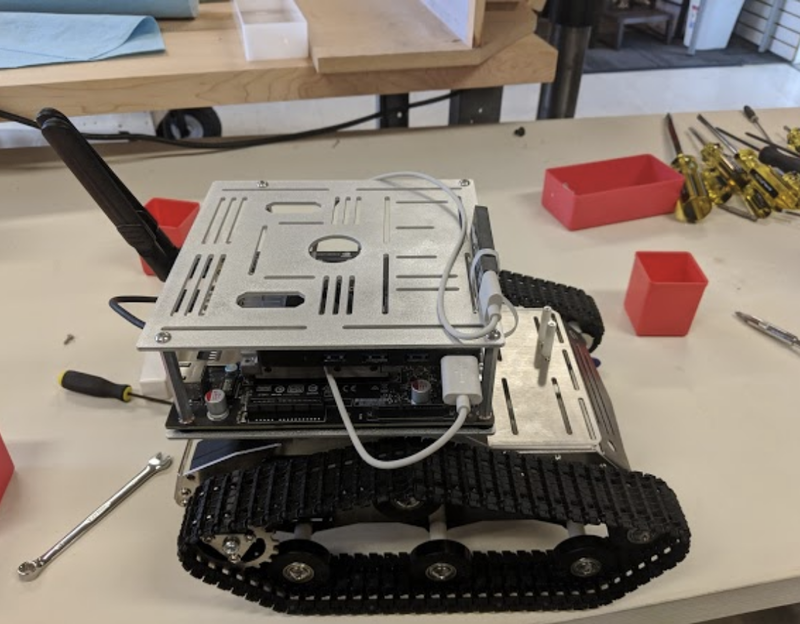 To solve this, we enlisted our co-op student Celinna Wu to design two additional mounting plates to house the TX2, a USB hub in the mezzanine layer and provide a very flexible mounting interface at the top. In addition, we replaced the plastic servo motors with metal gear versions of the same form factor. 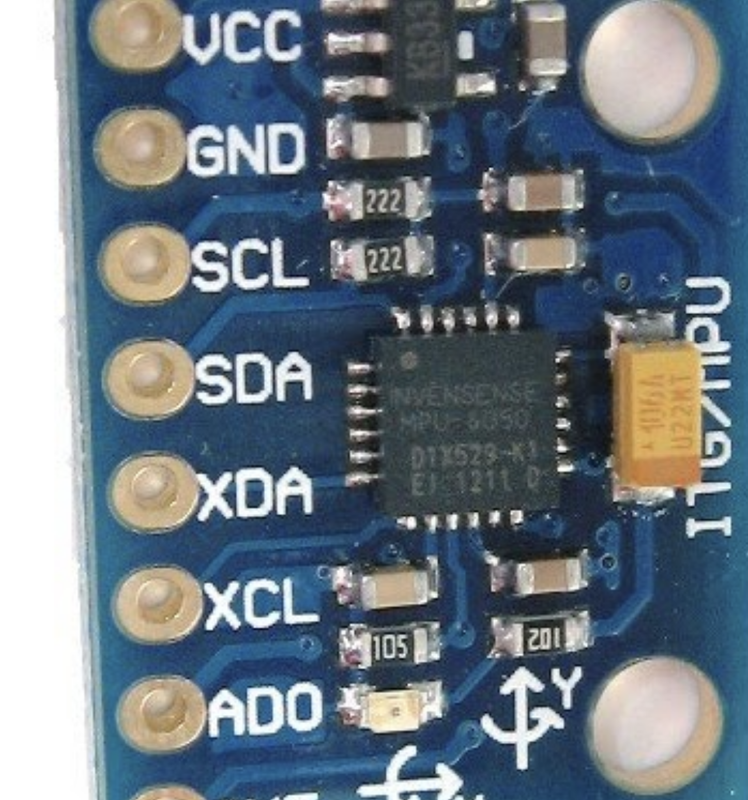 The TX2 development board features a CSI camera attached directly to the MIPI connector. Unfortunately, this camera did not immediately register as a Video for a Linux device. We found an excellent blog post by Peter Moran and several helpful comments on the Nvidia blog that helped us overcome this challenge. 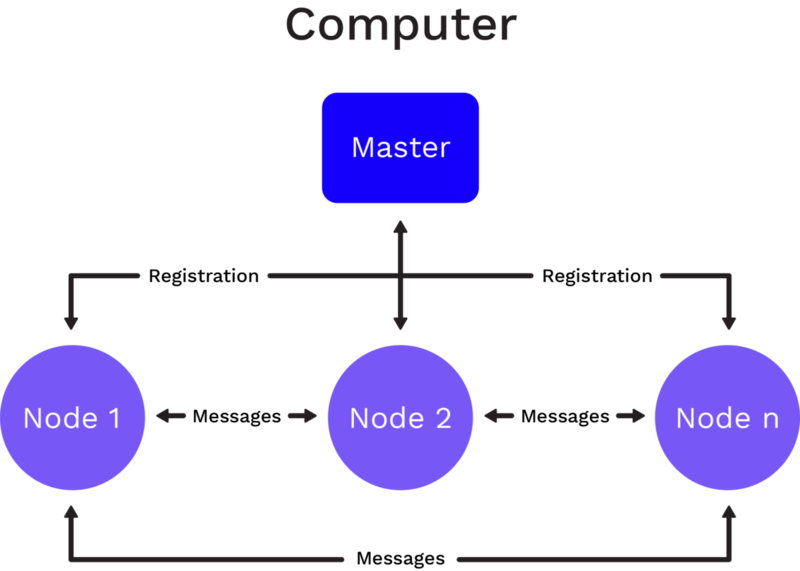 This pipeline can be used later in the ROS gstreamer node. Since the Kuman SM5-1 came packaged with a USB RGB camera, we figured we might as well incorporate it into our system. The camera registered as /dev/video1 and can be accessed as a standard V4L device. By sheer luck, we had an unclaimed sensor box for Arduino (37 sensors by Elegoo) lying around, and amongst other interesting things it contained the GY521 inertial measurement unit. We connected this unit to the Arduino and updated the sketch to allow for the motor driver and IMU code to coexist. Luckily the PS4 play-station controlled can be used with Linux on i86 and ARM architectures through the ds4drv driver. By default, only root can connect to the controller. Make sure to follow the installation instructions on the driver page to allow user access. 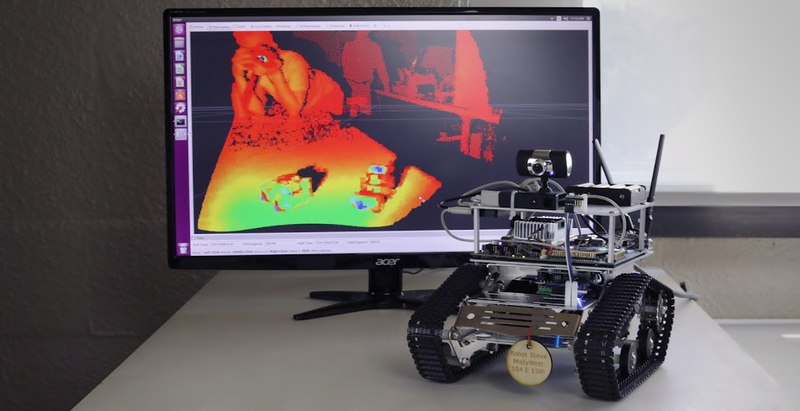 The Robot Operating System (ROS) provides a unified framework to write software for robotics. It is specifically designed to optimize code reuse and sharing. We have created a Bitbucket repository, which contains documentation, source code and third party repositories. It’s intended to be compatible with the ROS build system catkin. The final project structure should resemble the above snapshot. Then follow the steps in the README.md file and the documentation hosted on ReadTheDocs. After source code checkout, installation of the prerequisites, and successful compilation, it’s time to try out RoboSteve. For the demo, a tether to a monito via the HDMI connection, mouse and keyboard are necessary. A VNC connection would also work, but viewing the 3D point could be tricky. 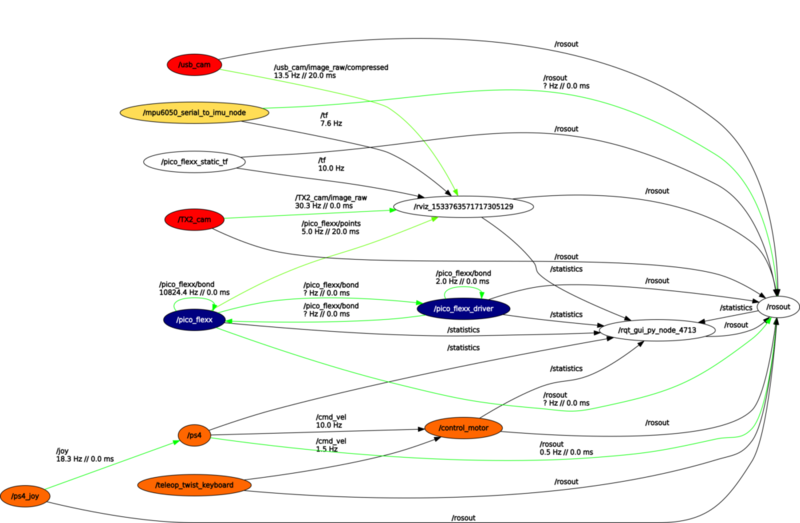 Compute Graph of RoboSteve ROS nodes in operation. 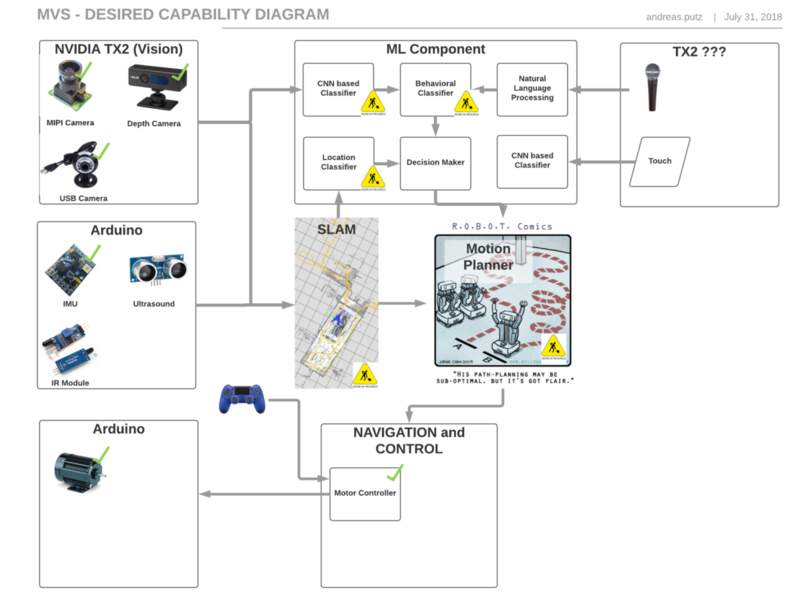 Red denotes camera nodes, blue the 3D acquisition systems, orange control for motors and servos and yellow other sensors like the IMU. 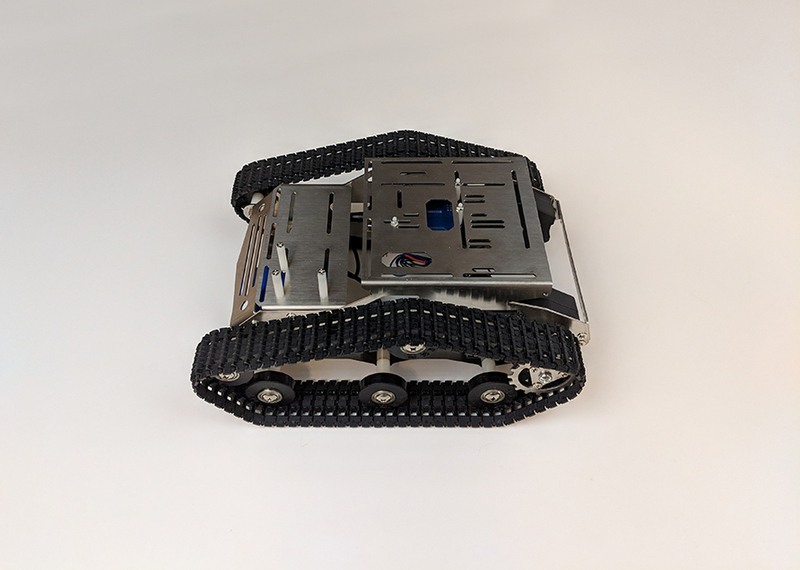 So, we finally have a basic mobile robotics platform. We can remotely control the robot, we get sensor feedback, and rqt shows a nice 3D point cloud of our environment.